You’ll squeal with delight when you discover that this sweet-and-sour pork dish won’t make you porky. Heat oil in a large wok or skillet over medium-high heat. Add pork, gingerroot and garlic. Cook and stir for 6 to 7 minutes, until pork is cooked through and begins to brown. Remove pork from wok and keep warm. Add green pepper, carrots and onions to wok. Cook and stir for about 5 minutes, or until vegetables are tender. Meanwhile, prepare sauce. Drain pineapple, reserving ½ cup juice. 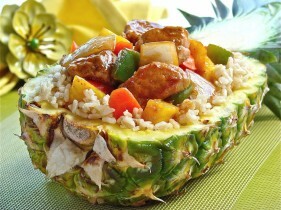 In a small bowl, combine reserved pineapple juice, ketchup, vinegar, brown sugar, soy sauce, cornstarch and chili powder. Add sauce to vegetables in wok, along with cooked pork and pineapple chunks. Cook until sauce is bubbly and has thickened, and pork and pineapple are heated through. Serve over hot, cooked rice.